Back in the early days, indeed! Afternoon, all! 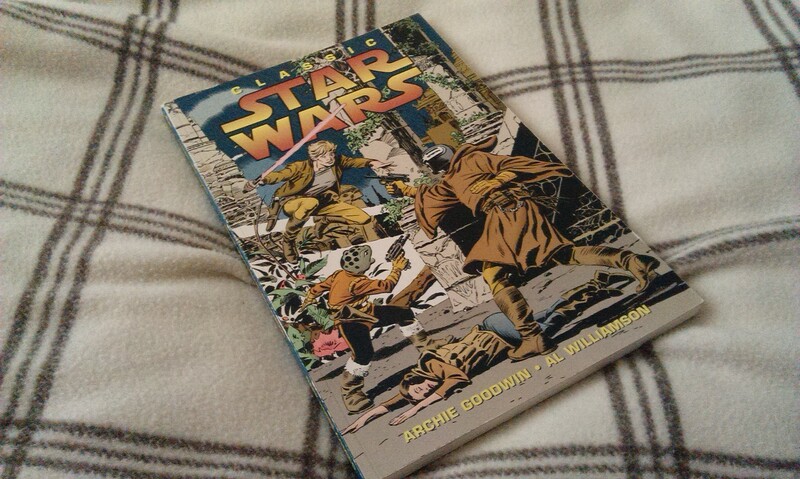 Welcome to another blog about Star Wars comics! I’ve been reading a lot of them lately, particularly some of the older ones, so thought I’d write something here about two volumes that, while currently difficult to find, will possibly be reprinted now that Marvel seems to be rummaging through the back-catalogue for stuff to print. Have you ever wandered who was the bounty hunter Han and Leia ran into on Ord Mantell? Well, back in 1981 that story was told in the daily comic strip as The Bounty Hunter of Ord Mantell, which is a catchy title, I’m sure you’ll agree! 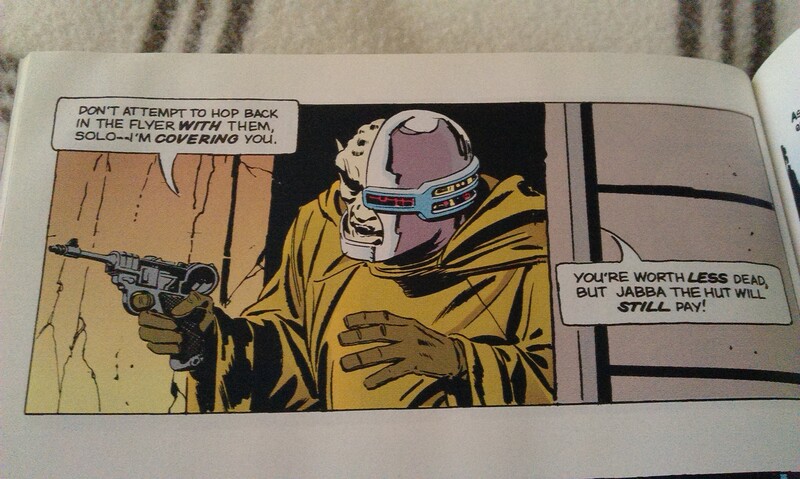 The bounty hunter in question is a strange chap called Skorr, who was specifically created to be a recurring villain and prevent over-exposure of Darth Vader in the early years. Basically, while out scouting for a new base, Leia and Luke are nearly ambushed by Imperials and their ship is destroyed: when they fail to check in, the Alliance presumes them dead, though Han refuses to believe it and heads off to see for himself. He rescues the pair, but in the process his ship is damaged and he needs to put into port for repairs – at Ord Mantell! There, the bounty hunter recognises Solo from Jabba’s posted bounty, and kidnaps Leia and Luke as bait to lure Han to his secluded base. Han follows Skorr to the base, and the three heroes are rescued by Chewie, but Skorr has planted a small homing beacon in Luke’s lightsaber, allowing him to follow the rebels as they flee the planet. They transfer the beacon to a life pod, which is picked up by the Imperials as they pass through the system on manoeuvres, and flee to Yavin IV. It’s not a bad little story, very much in keeping with those being told around this time in the Marvel series, for instance. 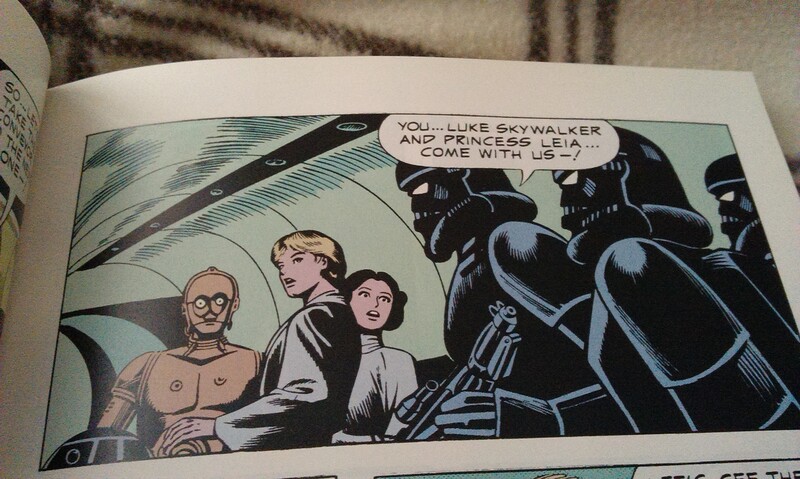 Luke is jealous of the apparent bond between Han and Leia, while still trying to come to grips with his growing power in the Force. It was reprinted as part of Dark Horse’s Classic Star Wars line back in the early 90s, in the now-scarce In Deadly Pursuit. Well worth checking out if you can still find it anywhere, of course! 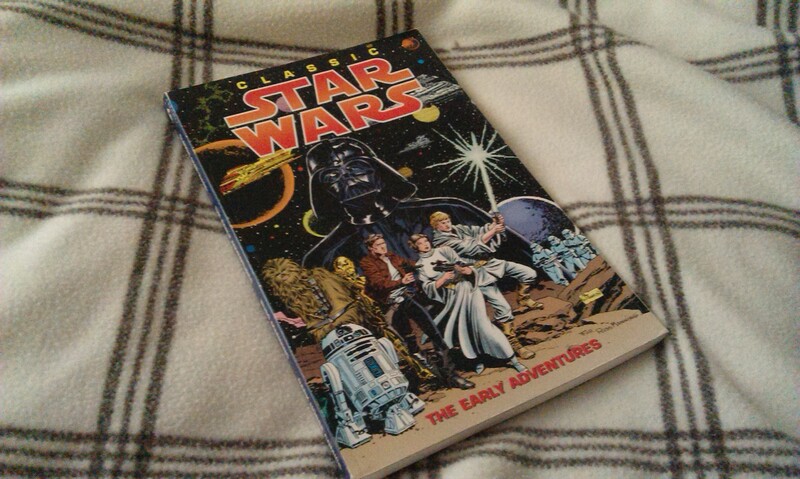 Also under the Classic Star Wars banner come a few little gems in The Early Adventures! Gambler’s World is an adventure set not long after the events of A New Hope, and was the first of the LA Times’ daily strips. While Dark Horse went through a lot of work to re-format the panels to fit a conventional comic-book style, and deserve a lot of credit for doing so, the nature of the original medium is such that we get a lot of recaps every few panels or so. We follow Luke and Leia, and the droids, as they travel to Vorzyd V – the Gambler’s World of the title – on a bit of a weird mission for the Alliance. A high-ranking official from the world wants to divert funds to the Alliance, as currently the Emperor is deriving far too many credits from the casinos. The mission has been discovered by a shadowy Imperial agent called Blackhole, however, who receives orders from Vader to find out who the official is by kidnapping the rebels. Blackhole is a now-legendary character of the EU. I mean this in terms of the fact that he is a character that looms large in the lore, not just that the story is part of the Legends line! His role in this story is something of a spymaster, and he would later be revealed to be the Director of Imperial Intelligence, in a messy arrangement that seems to exist outside the otherwise-established history of the bureau being headed by Armand Isard, then his daughter Ysanne. Hm. At any rate, Blackhole kidnaps Luke and Leia by using his black-armoured stormtroopers, but his interrogation is interrupted when C-3PO rescues them. There’s a lot of running around the planet, particularly following the droids on their adventures as they are almost-captured by a group of “Freelies” – orphaned children who smack strongly of 70s/80s punk. Anyhow, the rebels manage to escape from Blackhole’s stormtroopers, ready to fight another day! Among the pages of this book are some assorted adventures of the big three, all very much in the vein of “the further adventures”-types, giving the fans something more back in the early years between movies. 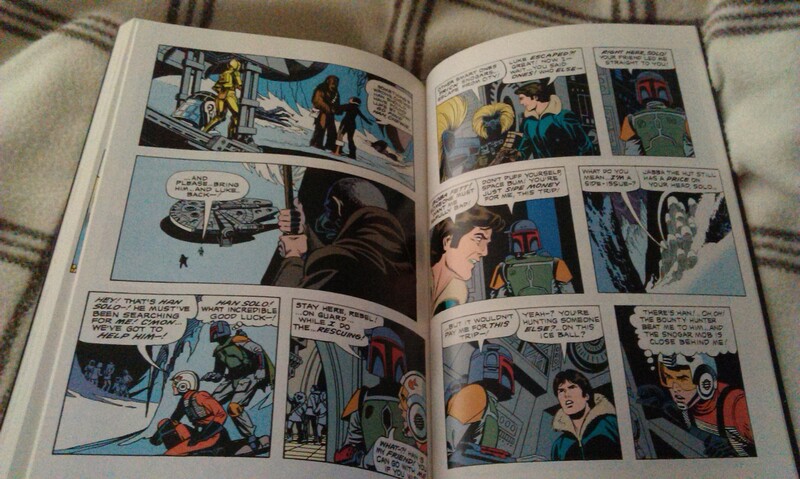 One of these, The Frozen World of Ota, features what I think is the first comics appearance of none other than Boba Fett! This strip first came out in the summer following Empire’s release, and showcases the rebels on another ice world, when they’re captured by a bunch of the natives who are trying to repair the heating mechanism of their city. Fett initially works alongside Luke to try to fend off the native Snogars, but soon goes after Han as a side-trip in his primary objective of pursuing the Imperial deserter called simply Mole. The bounty hunter is foiled in his attempts at both, however, which allows our heroes to escape. Along with his cartoon appearance in the fabled Holiday Special, this comic was apparently intended to help build interest for the character of Fett. For someone of so few words during the movie, he speaks an awful lot here, often showing off just how good he is (“Fools! My armor insures my victory in hand-to-hand combat!” etc). It’s good in that throwaway-story style mentioned above, though I’d still recommend this book more for the Blackhole story than for this one. 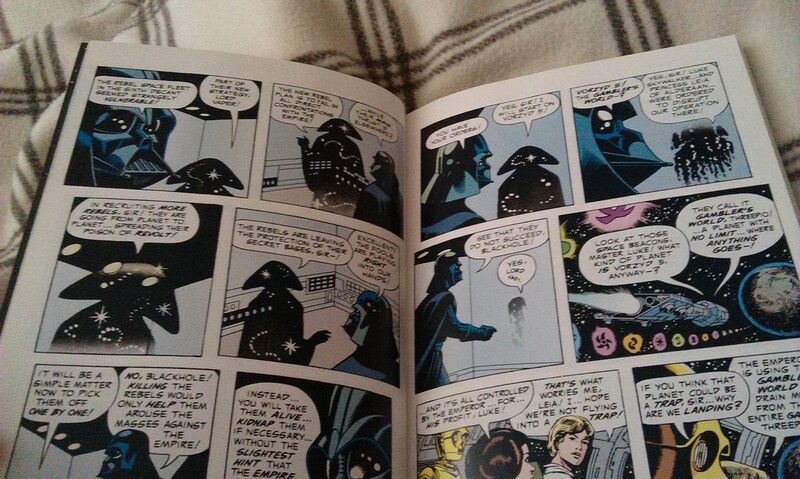 There are some really great Classic Star Wars stories to be enjoyed among the pages of these strips, and I’ll likely be investigating some more as time progresses! Next week is a special week here at spalanz.com, however – make sure you come back soon for that!